Today's post is a joint venture with our friend Ajnabi over at Paisa Vasool (or Not). By her own admission she is a relative newbie to the world of Bollywood but her fresh view on the medium clearly shows that she 'gets it' just as well as those of us who have grown up loving it. It was the summer of 1995 and I had just graduated from med school with only four weeks separating my last gasp of student life and the beginning of residency, aka my first real job. So I decided to take a quick trip to India to recalibrate my soul and took my buddy Hasan on the assignment with me. We landed in Bombay and after checking in to our hotel we decided to seek out the legendary 'Metro Theater' and watch whatever movie that happened to be playing there. The Metro was built in 1938 by MGM Studios (thus the name) and was THE premiere place for both Bollywood and Hollywood movies released in India for over half a century. With almost 1500 seats and a pedigree up there with the best cinema halls in the world we knew that we would not be disappointed no matter what movie was being shown. International flights to India invariably arrive in darkness and very early in the morning thus allowing one to get right to sightseeing if sleep can be successfully fought off. We had a lovely breakfast of chai & biscuits on Juhu Beach and arrived at the theater in time for the noon show. The scene that awaited us was nothing short of chaos - throngs of people, police literally beating back the crowds with sticks and jolted us into the reality that we were indeed in the birthplace of Bollywood. The sign out front which read 'House Full' did nothing to deter us and from previous experiences we knew the next step was to find the guy selling 'tickets in black' with those magic words रंगीला written on a piece of wafer thin paper. There were several scalpers about and they were all surrounded by desperate moviegoers looking to make a deal - in fact the whole thing resembled what the trading floor on Wall Street must look like. When our turn came we were offered the ever elusive balcony ticket and to make the deal even sweeter, with it we were entitled to get in 15 minutes early to see a 'Super Duper Laser Show Production featuring The Spirit of Rangeela'. How could we say no to that even though the Rs 150 we were forking over were six times the original price? We got our snacks/popcorn/Thumbs Up and were ushered promptly into our seats for the start of an incredible first day in India. Yes, the laser show was in reality a bunch of spinning lights on a globe and the Thumbs Up could have been a little colder but at that point we were just having too much fun and the movie itself did not disappoint one bit. 'Rangeela' was the first soundtrack made for a Hindi film by A.R. Rahman and alot of careers were riding on it's success. Ram Gopal Verma had no real hits to his name and other than a role as a child in 'Masoom', Urmila was a virtually unknown actress. Aamir Khan was an established name but had a couple of flops prior to the release and there as in Hollywood, you are only good as your last movie. Only Jackie Shroff (or Jaggu Dada as he is affectionately known in his native Gujarat) was a proven name but had been given a supporting role and ironically was playing a movie star. The careers of all the principal players were never the same as the charisma of the two leads and the popularity of the soundtrack propelled this movie into becoming one of the biggest hits of the year. Playing the street smart orphan Munna (Aamir Khan) whose friendship with the starlet who dreams of making it big Mili (Urmila) and how their relationship gets tested when a Bollywood actor Raj Kamal (Jackie Shroff) gets into the fray made for an immensely watchable plot. Aamir Khan's dialogues and delivery using the slangish Bombay Hindi was something not seen since Amitabh did it to perfection with 'Don' almost twenty years earlier. And Urmila, playing Mili with equal parts sweetness and vamp, earned herself a Filmfare Award nomination for best actress. One of my favorite scenes from the movie finds Munna (in an attempt to show Mili that he is indeed as suave as that lout of a Bollywood actor Raj Kamal) donning a YELLOW suit and taking Mili to the Oberoi Sheraton where he is (unknowingly) foiled by an autograph signing Raj Kamal. Sweet, funny and tragic all in one fell swoop. The above picture (taken this year by the way) has absolutely nothing to do with the movie but is just a little bonus for all the Urmila Mantodkar fans out there. With her combination of looks and talent I just can't fathom why we don't see her in more movies. "...what the trading floor on Wall Street must look like." I so agree with this! Thank you for sharing this great account, Sanket. 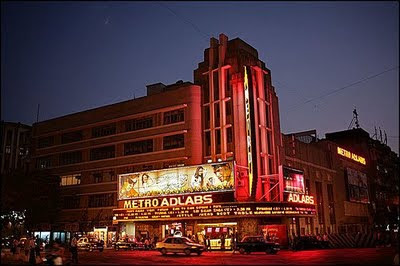 I grew up a couple-minute walk away from the Eros cinema in Churchgate, so I was more attached to it, but Metro is where I saw my first Amitabh Bachchan film on the big screen, and I have only fond memories. And yay for Thums Up!!! Also agree with your choice of favorite song. Udit Narayan and Aamir are inseparable, and it's great that Udit's able to tweak his voice enough to accomodate for Munna bhai's style. Besides, as I say in a comment to Ajnabi, I think the song was very cleverly used to develop the characters' motivations. I have yet to see this one, though it's waiting for me, but had to pop over from ajnabi's review to read your take. I loved reading this post with the personal context you've included. How amazing and different the movie going experience must be in India rather than here. If I ever get there, I think that will be one experience I won't be able to pass up. 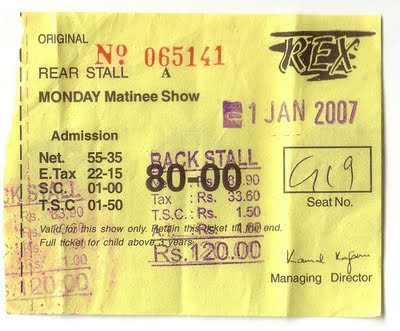 tBF - Thanks for the kind words and I have been to the Eros theater as well (my mom grew up near Churchgate). Agree that Udit is definitely the 'voice' of Aamir just as Kishore was the 'voice' of Amitabh. Have yet to see Ghulam but it is on my queue. Goa - we had never heard the word prawns before going there and certainly had never seen any quite so big! Unreal is definitely the right description. shell - Seeing a Bollywood movie in India is just the ultimate, with or without subtitles. My favorite cinema hall in India has to be Raj Mandir in Jaipur, just so over the top and grand. Thanks for stopping by! Memsaab - poor Jackie is (rightfully) much maligned for his choice of fashions, namely speedos, in this movie. I have always liked his work and feel he gives a very grounded & believable feel to his work. And trust me, the only real way to fight jet lag is to bombard your senses with a day of food, movies & sightseeing in Bombay your first day out. Did I really never post a comment here? Hm! Well, I fully enjoyed your memories, especially the "Spirit of Rangeela" light show--now THAT would have been awesome! Ajnabi - the mullet won't get you too many leading man parts either in Bollywood or Hollywood ;) I think he would do great in them as well and could make a good second career of that ala Mithun Chakraborty. Would do anything to see that light show again!